Can people, who have died, have any effect on us? Is contact with Mary necromancy? 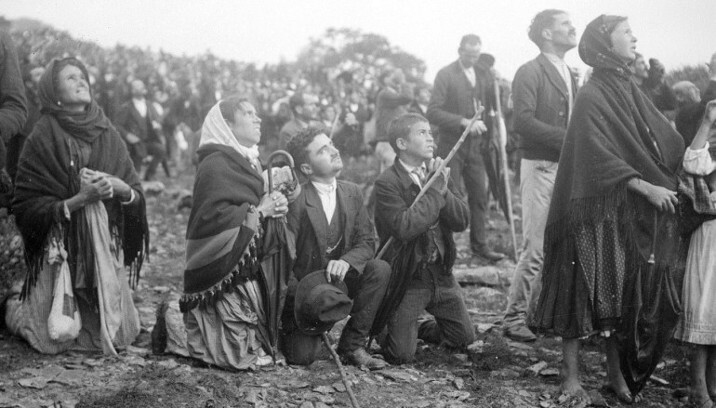 Do Marian apparitions take away from Jesus? Does the great Chasm prevent Mary from appearing? Lawyer claims Marian apparitions are not Biblical: He claims that the reason Marian apparitions [appearances] cannot be from God is because there is no historical precedent in Scripture for people appearing from the other side. I could have simply told him that his very emphatic statement was wrong, but if I did, it would have just caused an arguement so instead, I asked him a question; who were the two people that appeared with Jesus on the Mount of Transfiguration? He hesitated for a moment, seemingly somewhat embarrassed, and yelled, Good one! He could have answered Moses and Elijah, but then this would have been a contradiction of his first statement because here were two people who appeared from the other side. Is it better for me to set him straight or for him to set himself straight. I think the latter is better. After yelling, Good one, he hesitated again and said, but they couldn't talk! By saying that they couldn't talk, he was suggesting that there could be no communication with the people on the other side because to him this would have been necromancy, which is forbidden in Scripture. And if this is true then all messages coming from Mary would have been discredited. Well, he was wrong about this too: And behold, two men were conversing with him, Moses and Elijah (Lk 9:30). I don't think when Jesus spoke to two people from the other side he was performing necromancy. He actually is a very good lawyer; he simply made the mistake we have all made from time to time, and that is making a very emphatic statement only to have someone point out the obvious. Can people, who have passed on, have any effect on us? Along with this, other people suggest that those who have gone before us cannot in any way affect us. The people who have gone before us are simply dead saints and in no way can they help us; thus Mary cannot help us. I asked one individual, Where does it say in Scripture that people from the other side cannot in any way help us? She responded with another question, Where does it say that they can help us? The reason she answered my question with a question is because there is nothing in Scripture that prohibits people on the other side from involving themselves with us. In fact, we already determined from Luke that people can appear and speak from the other side. However, her question is a very good one. Is there any indication in Scripture that people on the other side can affect us? Actually the Bible is very clear about this; for example it says, In his life he did wonders and in death his deeds were marvelous (Sir 48:14). We have Elisha performing marvelous deeds after death and one of these deeds happened when they threw a dead man on to the bones of Elisha. As soon as the man touched the bones of Elisha, he came back to life and rose to his feet (2 Kgs 13:21). To her question, where does it say they can help us? Elisha answers with performing marvelous deeds after his death, and one of his deeds was raising the dead back to life. This union with the saints on this side and the saints on the other side is referred to as the communion of saints in the Apostles Creed. In his life he did wonders and in death his deeds were marvelous (Sir 48:14). As a man was being buried, a marauding band was seen and the man was thrown into the grave of Elisha; as soon as the man touched the bones of Elisha, he came to life and stood on his feet (2 Kgs 13:21). Is contact with Mary necromancy? One person writing to me had this to say: I feel that any alleged contact with Mary is not only bogus but most likely a channeled evil spirit. This person was confusing legitimate appearances of Mary sent by God, with necromancy which is prohibited by God. People who practice necromancy are conjuring up spirits of the dead for the purpose of knowing the future or influencing future events. The Book of Deuteronomy speaks against necromancy: Let there not be found among you one who consults ghosts and spirits or seeks oracles from the dead (Dt 18:10-11). However, it is necessary to differentiate between apparitions sent by God and necromancy which is prohibited by God. Apparitions or appearances are quite different because no one is trying to conjure up anything. They simply happen because God wills them to happen: And behold two men were conversing with him: Moses and Elijah, who appeared in Glory and spoke of his exodus (Lk 9:30-31). Was Jesus practicing necromancy when Moses and Elijah appeared conversing with him? My point is simply that we should not necessarily assume that someone appearing from the other side such as Moses or Elijah or Mary is bogus or an evil spirit. People who fail to differentiate between legitimate apparitions sent from God and necromancy are leaving out significant portions of Scripture, probably without realizing it. In necromancy, people are in control and are using unholy means to gain knowledge or influence; in legitimate apparitions, God is in control for his good purposes. Do Marian apparitions take away from Jesus? I have often heard the statement; I don't know why I need Mary or Marian Apparitions. Isn't Jesus all sufficient? Jesus is all I need, and I don't need Mary; Jesus is God not Mary." Although not everybody uses exactly the same words, the basic message is this, that Mary is in some way given the status that belongs to God alone. This is a very real concern of some people; however, it is a concern that can be addressed quite easily using Scripture. If we are to be consistent, then we should apply the same rules consistently. If an apparition of Mary gives her a God status, then an apparition of Moses and Elijah would give them a God status also. Peter, James, and John could have said, I don't need this apparition of Moses and Elijah; Jesus is all I need. Jesus is my God, not Moses and Elijah. But, of course they didn't do that and for good reason, because God might have asked, who are you, the clay, the work of my hands, to tell the potter (Is 64:17), how He should do things? If God, in his good reasoning, sends Moses and Elijah or His mother Mary to appear to us, who are we to say, I do not need them, I need only Jesus? Of course it is not just Protestants that have difficulties with apparitions. When Mary first started appearing in Medjugorje, Father Jozo, the pastor of the church there, had great difficulty accepting this because he already had faith and so he didn't know why he needed these appearances of Mary. As he prayed and struggled with this, he finally concluded that if God was sending Mary, who was he to say he didn't need her. People who claim that they don't need Mary, after God sends her are, without realizing it, in essence saying that they the clay, are wiser than the potter; and that they don't need the person He sends. If God chooses to send Mary, I think we should listen to her. The reason we need Mary is the same reason that Peter, James, and John needed Moses and Elijah, and that is because God wills it for His good purposes. But what good purpose did Moses and Elijah serve? The answer to this can be found in the fact that they, spoke of his exodus that he was going to accomplish in Jerusalem (Lk 9:31). This exodus was a reference to the death, resurrection and ascension of Jesus, and so the ultimate emphasis is not on Moses and Elijah but, in fact, on Jesus. And so, if Moses and Elijah, by their appearing, emphasize Jesus, then I believe it is fair to say that appearances by Mary must in some way point to Jesus. Mary leads people to Jesus: As I studied the different things that are taught about Mary in the Bible and in the tradition of the Church, I could not find one thing that did not ultimately emphasize Jesus. I challenge anyone to come up with a legitimate teaching of the Church, about Mary, that does not ultimately emphasize Jesus. Mary's message today is the same message that she gave two thousand years ago, Do whatever He (Jesus) tells you (Jn 2:5). The most significant apparitions going on today have been going on since 1981 in Medjugorje and continue to this day. And in these Marian apparitions again Mary points to Jesus. 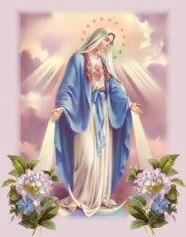 At the start of the apparitions, she greets the visionaries who are young adults now, with the words, Praise be Jesus. There are many messages and the most frequent message is the request for prayer for the conversion of sinners. One Yugoslavian Communist atheist who was to be an interpreter for some of the pilgrims in Medjugorje went there several days early. She did this in order to understand what was going on so that she could do a better job of interpreting. She was sitting in the back of Saint James Church and noticed that as people went to Communion and came back to their seats, their chests were illuminated. It was as though they went up as one person and came back as another. Of course, she was seeing a miracle that led to her conversion to Christianity. After this, she went home and converted her parents. Isn't it interesting that she went to Medjugorje to find out more about these Marian apparitions only to be led to Jesus in the Eucharist. The Medjugorje apparitions have as yet to be approved by the Church; they are still going on. There are many people who believe in them and there are people who vehemently do not believe in them. Medjugorje is in the hands of the Vatican and some day it will rule and say that Medjugorje is worthy of belief or not worthy of belief. When a Fundamentalist minister by the name of Dr. David DuPlessis came to Medjugorje, he asked one individual why he was reading the Bible, and he said, Because the virgin tells us to. He left Medjugorje with a favorable impression. One of Dr. DuPlessis' comments was that Catholics tend to adore Mary while Protestants tend to ignore her. Dr. DuPlessis has experienced a certain notoriety both in the Catholic and Protestant world. He sat in on Vatican 2 and for this he was excommunicated from the Assembly of God Church and in later years was reinstated. In Medjugorje, six people saw her; in the Ukraine over half a million people saw her including Communist KGB agents and Militia. A Russian officer who was a witness to the apparitions stated uncategorically, There is a God (Witness pg. 264). Youths came as Communists and left as Christians. This even had an affect on the Jews. That year (1987) several thousand Jewish families converted to Christianity (pg. 273). In the early Church, thousands of Jews converted within a short period. But, since this early time when has there ever been a conversion of thousands of Jews to Christianity within a very short time frame? It appears that Mary is quite the evangelist, again leading people to her Son Jesus. There are apparitions presently going on in other places such as Rawanda, Ecuador, Korea, Japan, Syria, and United States. Marionlogist Rene Laurentin maintains that there are about 300 different places in the world where Mary is appearing and frequently Jesus appears too. The messages frequently are an encouragement to prayer, Bible reading, fasting, conversion, faith, love, and unity of all Christians. The Church's stand on new apparitions is always one of caution because we know that Satan, the adversary, can appear as an angel of light, so there must be proper discernment. The Church proceeds with caution and after a time, usually years, the Church speaks for or against such apparitions. The Church does not require anyone to believe any apparition even when an appearance is judged worthy of belief. It would not be proper to assume that all appearances from the other side are from God, just as it would not be proper to assume that all appearances are from some type of evil spirit. Ultimately, you judge a tree by its fruits. In the apparitions that I have spoken of in Medjugorje, Mary greets the seers with the words, Praise be Jesus, with millions of Christians experiencing deeper conversions, with, and with hundreds, if not thousands, of miraculous physical healings, I find it difficult to believe that channeled evil spirits could be behind the many conversions to Jesus. If this were true, then Satan's kingdom would be divided and Jesus said, If a kingdom is divided against itself, that kingdom cannot stand. And if Satan has risen up against himself and is divided, he cannot stand; that is the end of him (Mk 3:24-26). Even Jesus was accused of operating by the power of evil: Just because the allegation is made that someone's power is of Satan does not necessarily make it so. Remember, Jesus was also accused of operating, By the prince of demons (Mk 3:22). And so I may not like it that someone tries to associate appearances of Mary with evil spirits; however, I should not be surprised either. After all, Jesus said, If they have called the master of the house Beelzebub, how much more those of his household! (Mt 10:25), and I believe Mary would qualify as being of the household of Jesus. Saul in his blindness persecutes Jesus: I do not think that most of the people who try to associate appearances of Mary with evil spirits, or necromancy, or witchcraft, or New Age, are doing it with malice in their hearts. They remind me of Saul on the road to Damascus. Just as Saul thought he was doing the right thing by attempting to bring the disciples of the Lord back in chains, people who try make an association between Mary's appearances and evil spirits believe they are doing the right thing. I believe Jesus' response to these people would be the same as it was with Saul, Why are you persecuting me? I am Jesus whom you are persecuting (Acts 9:5). That person may say, I am not persecuting Jesus. However, as long as you are misrepresenting Mary, His mother, you are in fact persecuting someone, and that person is ultimately Jesus. I do not in any way imply that all Protestants are detractors of Mary. In fact, there are some who are great defenders of Mary and at the same time there are some Catholics who pay no attention to her. God favors Mary and Jesus exalts the humble: If we have found that in some way we have been talking down to Mary rather than exalting her, we need to humble ourselves, and listen to Mary as she continues to say, Do whatever he tells you. And what Jesus tell us is that, the one who humbles himself will be exalted (Lk 14:11). Mary humbled herself when she said, Behold I am the handmaid of the Lord. May it be done to me according to your word. We find God exalting her through the angel Gabriel: Hail, favored one! The Lord is with you (Lk 1:28). Elizabeth exalted her when she said, Most blessed are you among women, and blessed is the fruit of your womb (Lk 1:42). The question is often asked, Why the great emphasis on Mary; why should we favor Mary? And the answer is simple: because God favored her first, Mary, for you have found favor with God (Lk 1:30). If God favors Mary, who are we not to do likewise? The one who humbles himself will be exalted (Lk 14:11). John Newman and Mary: I would like to say a word about an avid anti-Catholic of the previous century by the name of John Newman. He seemed to understand the Catholic Church fairly well; the Pope was the Antichrist and Catholics practiced idolatry in their devotions to Mary. However, as he studied the Eastern fathers of the Church and the Greek Orthodox Church, he was surprised to find this great devotion to Mary that even appeared to surpass that of the Catholic Church. This struck him because he was taught that this devotion to Mary was one of the signs that the Catholic Church was not Christian. He later left the Anglican Church and joined the Catholic Church eventually becoming a Cardinal. Of course his thinking about the Pope changed. He was no longer the Antichrist and his thinking about Mary changed also. It can be summed up in something a Jesuit priest once told him: You can't love Mary too much, provided, of course, you love God a great deal more. After sending this letter, I had someone call me on the phone who was very irate with me for this letter. He didn't believe people could legitimately appear from the other side, even though there is a historical precedent for it in Scripture. I listened to him for about an hour, and I only asked him one question during this time: Where in the Bible does it say that people are prohibited from appearing from the other side? He quoted many verses, but could not come up with any that was a prohibition. Does the great Chasm prevent Mary from appearing? One of the verses he quoted that looked as if it might have some merit is in Luke, the Parable of the Rich Man and Lazarus. It says, Between us and you a great chasm is established to prevent anyone from crossing who might wish to go from our side to yours or from your side to ours (Lk 16:26). He was suggesting that this great chasm is what prevented people from appearing from the other side to this side. I maintained that this chasm was not between this world and the next and so I suggested that we check it out. He declined, saying that this one Scripture wouldn't convince me anyway. He finally hung up, but not before accusing me of being a heretic. After he hung up, I understood why he didn't want to look at Luke 16. If you look at this chapter in context, you will discover that the chasm between us and you is not between this world and the next, but between the bosom of Abraham, and the netherworld. The poor man was carried to the bosom of Abraham (Lk 16:22) and the rich man was experiencing torment in the netherworld (Lk 16:24). I had another person present this same argument to me and I gave him the same explanation. However, he took the argument one step further and quoted: He said, 'Then I beg you, father, send him to my father's house, for I have five brothers, so that he may warn them, lest they too come to this place of torment.' But Abraham replied, 'They have Moses and the prophets. Let them listen to them'(Lk 16:27-29). He reasoned that, because this is clearly a request for someone to actually go from the bosom of Abraham to this world, and the request is not granted, this is proof that the chasm is between this world and the next. The first part of his reasoning is correct. This was a request for Lazarus to come from the bosom of Abraham to this world (Lk 16:27-31). His error was in concluding that the rich man's request was not granted because of the chasm. Abraham gives us the real reason for the refusal, and it had nothing to do with a chasm. If they will not listen to Moses and the prophets, neither will they be persuaded if someone should rise from the dead (Lk 16:26). Even if we concluded wrongly, that the chasm is between this world and the next, it still didn't keep God from sending Moses and Elijah (Lk 9:30) from the other side. And even if the Lazarus of the Gospel of Luke was not allowed to rise from the dead, the Lazarus of the Gospel of John was allowed to, Lazarus has already been in the tomb for four days. He (Jesus) cried out in a loud voice, 'Lazarus, come out!' The dead man came out (Jn 11:17-42). Why didn't the chasm stop Lazarus from rising from the dead? If your response is, that Jesus is God and nothing will be impossible for God (Lk 1:37) then I agree. Chasm or no chasm, if God wills it, then Moses, Elijah, Lazarus, Mary, or anyone else can appear from the other side and the false cries of necromancy by some will not prevent this from happening. Jesus appeared transfigured with Moses and Elijah, and in another scene, Jesus commanded Lazarus to come back from the dead. There are those who admit that these things did happen in Scripture yesterday, but will not allow that Jesus can make these same types of things happen today. They will in effect be saying that Jesus is not the same yesterday and today. However, Scripture says: Jesus Christ is the same yesterday, today, and forever (Heb 13:8). Some Spirits are evil while some belong to God: People who suggest that all apparitions from the other side are evil spirits are not only in violation of Luke 9:30, but are in violation of 1 John. Beloved, do not trust every spirit but test the spirits to see whether they belong to God, because many false prophets have gone out into the world. This is how you can know the Spirit of God: every spirit that acknowledges Jesus Christ come in the flesh belongs to God, and every spirit that does not acknowledge Jesus does not belong to God. This is the spirit of the Antichrist (1 Jn 4:1-3). The reason that we need to test the spirits is because some belong to God while others do not. In believing that all spirits are evil, we are in opposition to the Bible, which indicates that some spirits do belong to God. There are some people who absolutely insist that any and all spirits that manifests themselves are evil. Therefore, to them all apparitions are evil based on their Bible. They claim the Bible ALONE; if ONLY they would believe their Bible. They are simply ignorant of the fact that John the apostle said that every spirit that acknowledges Jesus Christ comes in the flesh belongs to God.